The bike trail on Canal de l'Ourcq stretches out over several kilometres in the Parisian region between Pantin and Seine-et-Marne. 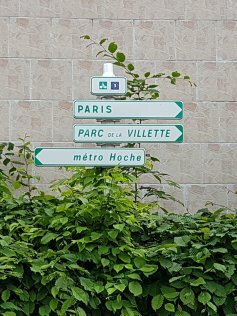 It was set up by the administrative department of Seine-Saint-Denis and crosses through several municipal towns; Pantin, Bobigny, Bondy, Aulnay-sous-Bois, Sevran, Villepinte, Tremblay-en-France and then the track continues to Seine-et-Marne. From the bike trail on Canal de l'Ourcq, many more bike itineraries are possible. 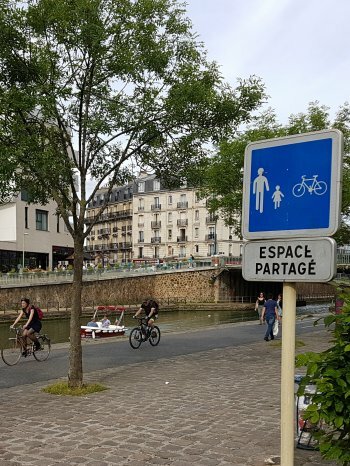 To access the bike trail on Canal de l’Ourcq from Paris 19th district, cyclists have the possibility to take the bike trail that runs along Bassin de la Villette, along the banks of Loire and Marne. This bidirectional bicycle track runs via Parc de la Villette. If you start your cycle trip from the Seine quays to Bassin de la Villette, you must cross the lift bridge at Rue de Crimée to reach the Marne quays and the cycle path , Ourcq. The bike trip from Bassin de la Villette to the starting point "official" cycle path canal de l’Ourcq only takes about 10 minutes. The cycling path that runs along Canal de l’Ourcq is a bike path reserved for cyclists, separated physically from the paved embankments and the pavement. This bidirectional track at variable length may be used by joggers and walkers. After the peripheral road, the panoramas on the banks make it possible to discover and enjoy the majestic views of the building such as Grands Moulins Pantin and National Dance Centre, adjacent to the canal. You will see Pantin town hall from the bike track at the level of the bridge at Mairie de Pantin. After the National Dance Centre, the cycle track runs along Canal de l’Ourcq via the footbridge and continues along the track for less than one kilometre. The bike trail temporarily leaves the track of the former tow path to run along the railway tracks and the Technicentre SNCF. The bidirectional track runs along Canal de l’Ourcq from Bobigny. It runs alongside the departmental park of la Bergère where a drinking fountain can be found at the level of the sports equipment facilities. After crossing Noisy-le-Sec and Bondy, the cycle track runs once again along Canal de l’Ourcq and continues on this bank till Parc forestier de la Poudrerie Sevran Livry. After Tremblay-en-France, the cycle track Canal de l’Ourcq leaves Seine-Saint-Denis to reach the department of Seine-et-Marne. The cycle trail continues along the banks of Canal de l'Ourcq through the towns of Villeparisis until Claye-Souilly. At Villeparisis, the canal passes close to the market place. Seine-Saint-Denis administrative department is organizing the renovation of part of the cycle track in 2017 in Pantin and in 2018 at the Parc forestier de la Poudrerie. In Pantin, renovation work will modify the trail where it temporarily leaves the path for a few hundred meters along the canal banks and the Technicentre SNCF. At the level of Parc de la Poudrerie, renovation work will give access to the trail even during park closing times. The cycling path along the canal has its own bicycle lane independent of the banks. Motorized vehicles (moto, scooter, automobile) are not allowed on any of the cycling paths along Canal de l’Ourcq.